Ashdown AAA-100-BT - Lightweight, 100 Watt Bass Combo Amplifier, with Integrated Bluetooth Technology, and 1 x 12" Custom Speaker ..
After the success of the initial AAA-100 amplifier, Ashdown have upped the ante with the inclusion of integrated Bluetooth connectivity adding even more convenience and connectivity. Buy the Ashdown AAA-100-BT 100w Bass Combo at PMT and receive a FREE Pair of Meters RED-M-EARS In-Ear Headphones worth £39.99! Simply E-mail proof of purchase along with a postal address and contact number to info@ashdownmusic.co.uk and they will ship them out straight to you! 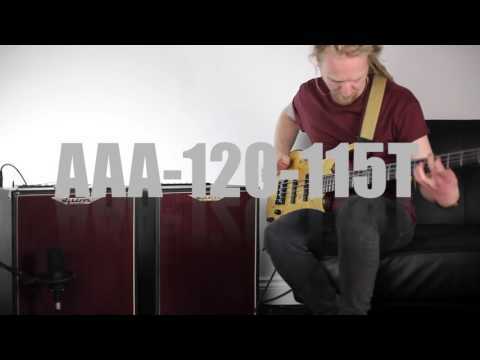 With the Ashdown AAA-100-BT you get a lightweight, feature-packed 100 Watt bass amp combo, with that powerful Ashdown bass sound, and bags of extra features. Ashdown have been setting the standard in the world of bass amplifiers since 1997, and with the AAA-100-BT they continue to do so! With the inclusion of Bluetooth technology in modern amplifiers becoming more prevalent, it was only a matter of time before an amp-maker such as Ashdown would join the party. This connection allows you to stream music directly through your amp via your mobile device, with pristine audio quality. In addition to Bluetooth technology, the AAA-100-BT comes complete with an awesome array of facilities. These include both passive and active circuits with associated inputs, a balanced DI output (perfect in a live-setting at a larger venue), and lightweight ply construction. You can also sculpt your ideal sound, thanks to the awesome footswitchable tube emulated overdrive circuit, 4-band EQ, sweepable mid-control, and much besides! As with other amplifiers in the Ashdown AAA range, the AAA-100-BT features an awesome Apptek socket. This allows you to access a huge range of amp simulators and effects via your smartphone/mobile device, making this amp ideally versatile for recording sessions as well as in a live situation. Due to its versatility, easy to use nature, and relatively affordable price, the Ashdown AAA-100-BT is the ideal amplifier for bassplayers looking to pick up a decent gigging amp for small to medium-sized venues. Call into your local PMT Store and talk to one of our resident bass experts to find out more, and maybe even request an in-store demonstration - you won't regret it! Order your Ashdown AAA-100-BT at PMT Online or In-Store today and make use of our fantastic 0% Finance and Free Home-Delivery options!